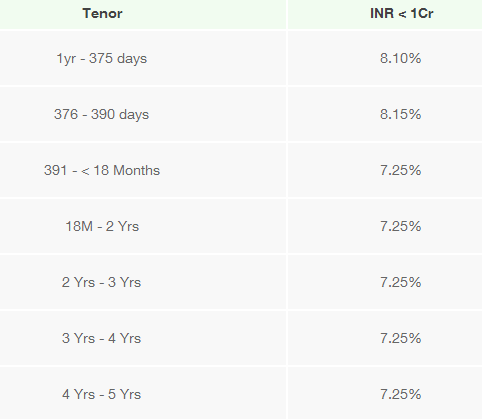 Are you looking for fixed deposit interest rates of Indian banks? Then you are at right place. In this article we will provide you fixed deposit rates paid by banks of India along with time period and investment issues. Which banks will pay the highest rate of Interest on Fixed Deposits? Best rate of interest on Fixed Deposits in India nowadays ? 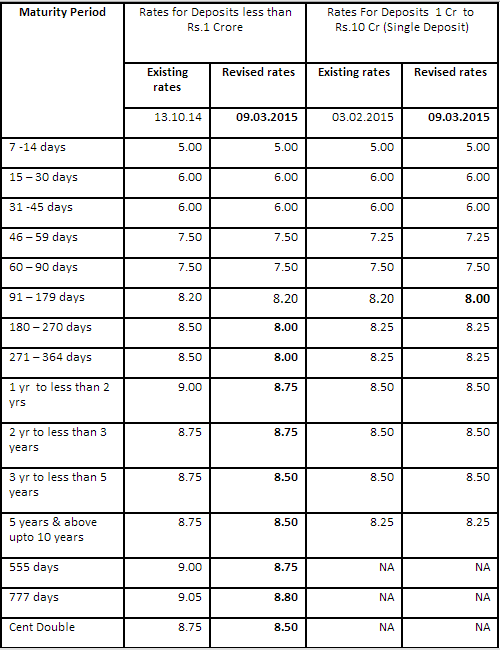 Comparative bank Rates in India. 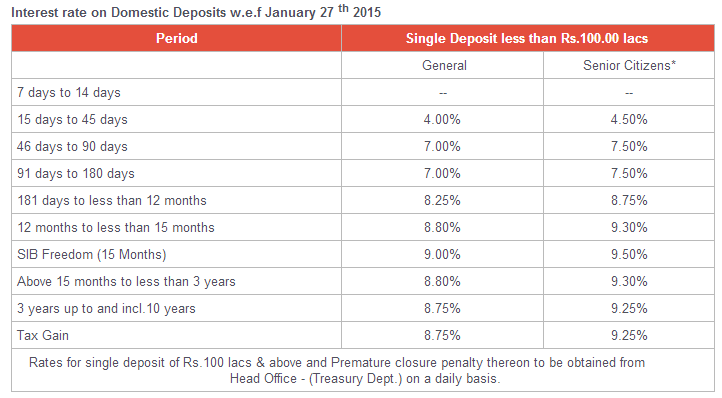 latest deposit Rates of Banks in India 2015? We give below the Highest Rate of Interest or the maximum rate of interest on Fixed Deposits in certain buckets offered by banks in India in 2015. Catholic Syrian Bank Limited is a private sector bank with headquarters in the Thrissur district of Kerala, India. It is one of the oldest banks in India: it was founded on 26 November 1920,well before Indian independence, and opened for business on the following New Year's Day. At present, the bank has a network of 431 branches and 233 ATMs across India. Catholic Syrian Bank fixed deposit Rates are given below. Yes Bank is India's 4th largest private sector Bank, established by Rana Kapoor in 2004. Yes Bank is the only Greenfield Bank licence awarded by the Reserve Bank of India in the last 2 decades. Yes Bank is a “Full Service Commercial Bank”, has steadily built a Corporate, Retail and SME Banking franchise, Financial Markets, Investment Banking, Corporate Finance, Branch Banking, Business and Transaction Banking, and Wealth Management business lines across the country. 1> Simple interest will be paid quarterly. 2> Monthly interest payout scheme is also available at discounted rate. 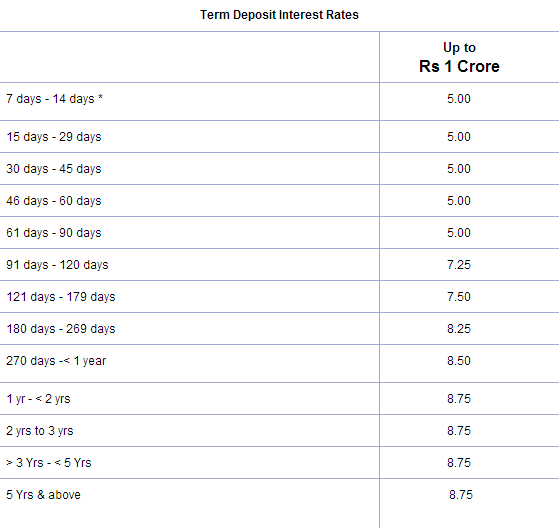 3> Deposits can be made for period ranging from 15 days to 10 years. 5> Can give auto-renewal instructions. 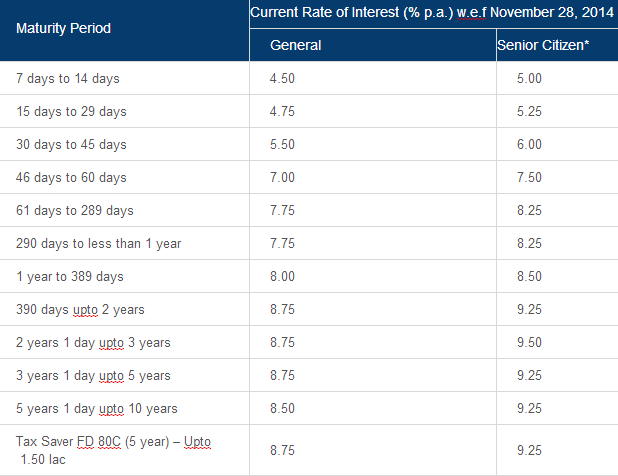 Note That- An additional interest rate of 0.50% p.a. over and above the normal rate of interest for any of our Time Deposit Schemes & also for Tax Saver Depositors Scheme will be given as incentive for deposits of Senior Citizens who are above 60 years of age. ICICI Bank is an Indian multinational banking and financial services company. The headquarter of ICICI Bank is located in Mumbai, Maharashtra, India. As of 2014 it is the 2nd largest bank in India in terms of assets and market capitalization. It offers a wide range of banking products and financial services for corporate and retail customers through a variety of delivery channels and specialized subsidiaries in the areas of investment banking, life, non-life insurance, venture capital and asset management. The Bank has a network of 3,880 branches and 12,269 ATMs in India, and has a presence in 19 countries. HDFC Bank Limited is an Indian banking and financial services company. The head quarter of the bank is located in Mumbai, Maharashtra. It is the 5th largest bank in India by assets, incorporated in 1994. It is the biggest private sector bank in India by market capitalizationas of 24 February 2014. As on Jan 2 2014, the market cap value of HDFC was around US$26.88 billion, as compared to Credit Suisse Group with US$47.63 billion. Allahabad Bank is a nationalised bank. The headquarter of the bank is located in Kolkata, India. It is the oldest joint stock bank in India. On 24 April 2014, the bank entered into its 150th year of establishment. It was founded in Allahabad in 1865. Punjab National Bank is an Indian financial services company based in New Delhi, Delhi, India. Founded in 1894, the bank has over 6,300 branches and over 7,900 ATMs across 764 cities. It serves over 80 million customers. Punjab National Bank is one of the Big 4 banks of India, along with State Bank of India, ICICI Bank and Bank of Baroda. State Bank of India is an Indian multinational, Public Sector banking and financial services company. It is agovernment-owned corporation with its headquarters in Mumbai, Maharashtra. As of December 2013, it had assets of US$388 billion and 17,000 branches, including 190 foreign offices, making it the biggest banking and financial services company in India by assets. Union Bank of India is one of the largest government-owned banks of India (the government owns 60.13% of its share capital). It is listed on the Forbes 2000, and has assets of USD 13.45 billion. All the bank's branches have been networked with its 6420 ATMs. Note that- Additional rates of interest of 0.50% applicable for senior citizens for Deposits of 1 year and above. IDBI Bank is an Indian government-owned financial service company, formerly known as Industrial Development Bank of India. The head quarter of the bank is located in Mumbai, India. Indian Overseas Bank is a major bank based in Chennai (Madras), with about 3350 domestic branches, including 1150 branches in Tamil Nadu, 3 extension counters, and 8 branches and offices overseas as of 30 September 2014. IOB has an ISO certified in-house Information Technology department, which has developed the software that its branches use to provide online banking to customers; the bank has achieved 100% networking status as well as 100% CBS status for its branches. IOB also has a network of about 3300 ATMs all over India.